Bundesliga club Borussia Dortmund have signed midfielder Kevin-Prince Boateng on loan from Tottenham until the end of the season. The 21-year-old was frozen out by former Spurs boss Juande Ramos, though he has featured twice since the arrival of Harry Redknapp at White Hart Lane. The loan deal includes an option for Dortmund to buy Boateng. "First we want to see how he is," said Dortmund general manager Michael Zorc. "He hasn't had an easy time." 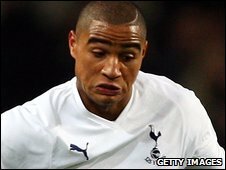 Tottenham signed Germany Under-21 international Boateng from Hertha Berlin in July 2007 for a fee thought to be in the region of £5.4m. He had been voted Germany's best young player in 2006 and made 43 appearances for Hertha. "Kevin sees the change as a great personal opportunity," added Zorc. Boateng was due to join his new club at a training camp in Marbella as Dortmund prepare for the resumption of the Bundesliga at the end of the month.